Jaco: a surfer's paradise. Located on the Pacific coast in the central region of Costa Rica, this town offers easy access to everything the region, and the country, has to offer. Although it's a small town, the vibe here is full of energy. Surfing and partying tend to be on many of the younger travelers' agendas, although there are plenty of spots to relax if you need something a bit more quiet. Or perhaps you need something in between, where you can party when you want to but retire to a clean, quiet getaway? Jaco offers a wide variety of accommodation, as well as great restaurants and a beautiful beach. So why not learn to surf while you're there? Be warned, a town with a party reputation such as Jaco is bound to have some crummy hostels and hotels for those looking for a cheap flop house. Not all "party hostels" are equal. The following establishments might be party oriented and somewhat noisy, but they are clean, safe, and offer full services to be expected by discerning travelers. 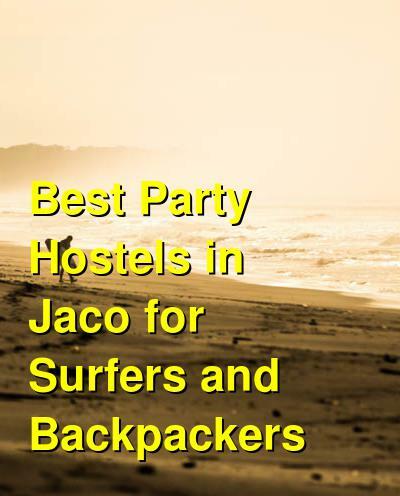 How much do hostels in Jaco cost? Steps from the beach and a short walk to everything in town, this Hostel offers a surf school in a clean, comfortable environment that encourages social interaction in the best kind of way. With a rooftop bar and restaurant, a pool, nightly movies, and surf lesson packages, it will be a challenge not to make new friends. They also offer a communal kitchen if you wish to make your own meals, plus Wi-Fi and laundry. BBQs and bike rentals are also offered. This modern and clean multi-story building provides a very nice yet affordable environment. (Great bathrooms!) Private rooms are available in addition to the hostel beds. Offering a "ladies night" at the bar every night (with free drinks) should let everyone know that this is the place in town where everyone goes to have a good time. Right near the beach and located in the middle of town, this super-convenient location offers a variety of room types (private rooms of various sizes, plus hostel beds). The onsite bar and restaurant serves up meals, and a communal kitchen is also available. Other standard amenities include lockers, a game room, BBQ, bike rental, laundry, and other standard hostel offerings. The atmosphere is nice with hammocks and community areas for relaxation. Check out the photos for a good idea of what to expect. One of the first hostels in the area, this place has a long list of good reviews. Located right on the beach, they offer surf lessons for beginners to help you get up on your board. With a caf�/bar around the pool, this hostel and hotel provides a relaxed atmosphere that is perfect for making new friends every evening of your stay. They offer both private rooms and small dorm rooms. The facilities are kept clean. They offer free Wi-Fi and other standard amenities such as laundry, tours of the surrounding sights, lockers, kitchen, and more. They take security seriously, with locks and lockers, and even for motorcycles. They don't just want you to have fun, they want you to stay safe while doing so! Only a couple of blocks from the beach and the center of town, this quieter spot offers hostel beds and private "structured tents" with electricity and air conditioning. By staying here, guests have access to the pool and bar at the nearby Riva Jaco club. This provides the social activity of an otherwise quiet and relaxing hostel. They offer free Wi-Fi, BBQ, lockers, a kitchen, free parking, and a cafe. Previous guests have stated that this location is not in the exact middle of town, and that is exactly why they like it - it offers a quiet escape from the parties of other hostels closer to the beach.